In a time of fantasy and magic, a band of misfits stumbles from adventure to adventure - and occasionally saves the world! 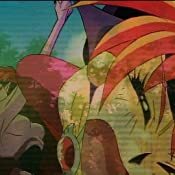 Lina Inverse, a spunky sorceress with a penchant for destruction, is joined by dashingly dim swordsman Gourry, driven young Amelia, and stoic Zelgadis on a journey spanning the realms. In lands where darkness reigns, they will be light. In lands where doom threatens peace, they shall be saviors. 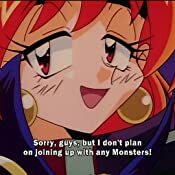 Yes, when evil arises, Lina and her ragtag crew action for the forces of good - and if fame, fortune, and food should fall their way, even better! They're Heroes. They're Rogues. They're just looking to make a buck. They're The Slayers! 5.0 out of 5 starsGood clean show.. at least the first 3 seasons.. 4 and 5, not so much. This series was a very fun one to watch. Usually during longer runs, like this show has, you will get a bunch of filler episodes in there, that look as if they were put in there just to fill in the episode number request. This show really did not have many, if any, of them, so, what you get is a show that you do not get tired of. I felt that each season had it own ending, that make it feel like you could stop there, and not miss anything.. But then the next season started up seamlessly. This is nice because, if you decide to stop at season 3,a nd not go for season 4 and 5, you will not feel like you are missing anything. Before I get to some info about the show, I do have to give one warning.. There is a season 4 and 5 out there of this show. They are NOT as good as the original first three seasons. The movies they did a decent job of keeping up with the shows personality, but, the seasons 4 and 5, they completely dropped a lot of the distinct, and entertaining part of Lina's personality. It almost seemed like they had a completely different writer for the last 2 seasons, and then changed her personality, to shorten the show, just to get to the ending faster. IMO, It did not work out that well.. So, for the first three seasons, I would give each of them 5 stars each. The movies I would give 4 to 5 stars each.. Seasons 4 and 5 I would go with maybe a 3 star rating. As for the show, it is a typical magic, sorcery, demons and dragons type of show. The main character, Lina, sorcery genius, travels with a companion, Gourry, which is a top notch swordsman. But, Lina is the straight forward type of person, that loves money, and will do most things for money, is insecure about her lack of feminine charm, and has not problem throwing a fireball at someone for going there about it.. and Gourry is more of a ditsy airhead, that does not remember most things, unless it revolves around food, and has to have everything explained to him.. The comic situations that come up because of that, get very entertaining, and comical. Later on, they meet up with, and start traveling with other companions, and even gets a rival (which is more one person trying to get lina) which add to the shows appeal. Overall, it is just good clean fun to watch. If you want more details about the show, I am sure that there is a ton of other reviews that go into more details, but, I did not want to spoil the show for you. This is a terrific series. 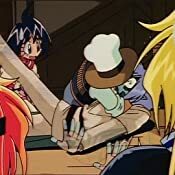 Occasionally I like to watch an older show (you just can't beat that pure cell animation!) and bought this to satisfy that craving. I had never heard of this series and can't remember how I stumbled upon it on Amazon, but I'm glad I did. This show can bring laughs no matter what you're doing. I have a nasty habit of doing several things at once, and even then this sucked me in. It's one of those shows that you can tell what's going on even when not paying 100% attention. But it'll be hard not to pay attention because it's so good. The characters are well rounded and likable, the stories are good, and the humor is top-notch. The show focuses on a small group of magicians and warrior(s) as they travel around their monster infested world seeking treasure and glory (and food.... mostly food.) Each of the three seasons serve as their own arc with it's own story. All of them build off of the previous seasons, but are somewhat self contained as well. 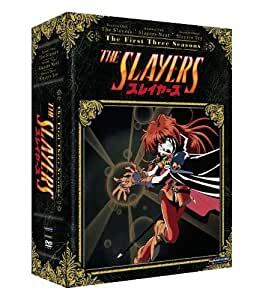 If you're looking for a good, old fashioned anime to relive days gone by, this is a great set! It'll also satisfy your craving for a fantasy genre piece, and since it's three full seasons, you've got days and days worth of watching. Definitely a must-have for anime fans! 5.0 out of 5 starsThe box is sub par, but the show is fantastic. So if you are looking at this box set, then it is safe to assume you have already watched the show and liked it. If for what ever reason you are in the mood for pressing your luck and buying a random old school show, then go for it cause the odds are high you'll enjoy it. The box itself is honestly not as luxurious as it looks. It's mostly made of a gift card like paper with a six page plastic DVD holder that holds a total 12 disks. Regardless of whether you're a collector or not, you'll have to take extra care of this case. Personally this case doesn't annoy me enough too deduct a point, because I only care the actual video quality of the DVDs. The video seems to be right from the source with zero enhancements, which is fantastic. It's in a 4:3 ratio with that classic cel animation look. The Japanese audio is better than the English audio (big surprise, I know), the main reason is because the Japanese audio is in true stereo whereas the English audio is in mono. This is extremely noticeable with the opening theme. So if you plan on watching this in English and care about good audio, well now you know. As for the subtitles, from what little I've actually looked at, I would say they are passable. Honestly, if you care about good subs, just learn the language already so you no longer have to. The series themselves are absolutely amazing, 5 stars for that part. 1) As other reviewers have mentioned the packaging is REALLY cheap and flimsy. It feels as if it would come apart in your hands if you'd watch the episodes more than once. Laminated paper and sticky tape, this has to be done better ! It feels nothing like an official licensed end-product. 2) The encoding of the video streams is really bad. Perhaps due to low quality source material, but more likely due to cramming too many episodes on each disk and mastering with some weird conservative default settings. I would've definitively paid more for a better quality version, had I known this beforehand.